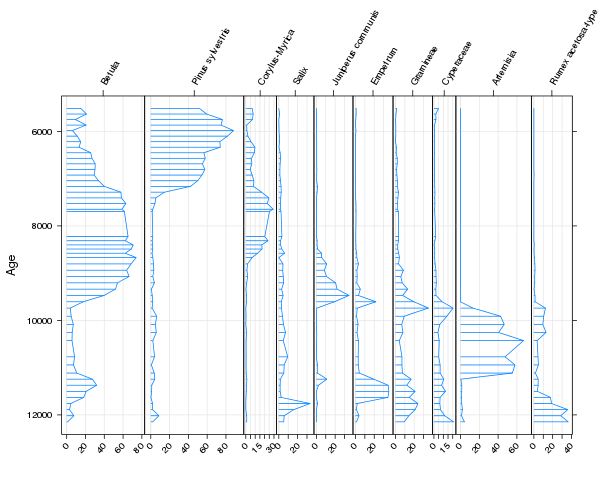 One of the routine tasks palaeoecologists do is plot data on species composition or geochemical proxies say along a sediment core or stratigraphic sequence. These diagrams are the canonical way of displaying stratigraphic data in this field. An example of a stratigraphic diagram is shown below. An example of a stratigraphic diagram is shown below. These plots are also a bit of a pain to produce, for various reasons. We want to cram as much information into a single diagram as possible, so when plotting species abundance type data, we use larger panels for abundant taxa and smaller panels for the less abundant taxa. Quite often we want to mix relative data types (e.g. relative abundances or compositional data) with absolute data types (e.g. geochemical proxies, palaeoenvironmental reconstructions, ordination summaries) and therefore only want to scale the sizes of the panels for the relative data types. We might want to display the data in the panels in different ways and add extra information to the diagram such as stratigraphic zones or an additional y-axis scale (dates as well as depths for example). Because of these special plotting requirements, the task of drawing stratigraphic diagrams has often been performed in specialist software; e.g. Eric Grimm's Tilia and Tiliagraph are an old example I used during my undergraduate dissertation, now updated for modern computers, or Steve Juggin's C2 programme. Having produced the figure in the specialist software, a lengthy post-processing process in Illustrator often ensued, to get the diagram looking just right and ready for publication. Being a Linux user for over a decade now, none of these applications would run on my computers without dropping back out to Windows, and because I use R all the time for my data analysis, it would be great if we could produce these plots using R. So I started writing some code that resulted in the Stratiplot() function in my analogue package. Stratiplot() uses the power of the Lattice graphics package and the odd bit of grid code to achieve pretty reasonable-looking diagrams (IMHO). 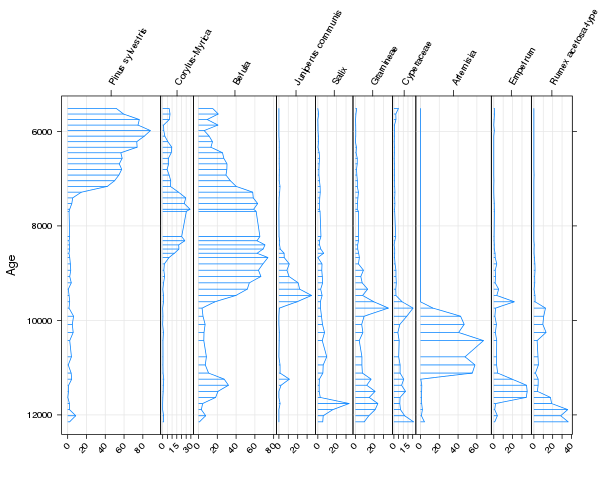 The first five have their usual meaning from the xyplot() function, whilst the last three are either unique to Stratiplot() (type "poly") or have been implemented differently because the data in a stratigraphic diagram move up the diagram and not from left to right (types "h" and smooth). These can be combined in whatever way you wish, as the underlying panel function panel.Stratiplot() tries to plot them in a sensible order so one graphical element doesn't obscure another element. In the example we limited the number of taxa that are used in the diagram via the chooseTaxa() function to select only those taxa that were present in at least 5 samples and were at least as abundant as 10% in any one sample. The criteria could have been made "either or" by using type = "OR" in the chooseTaxa() call. Stratigraphic zones can also be added to the diagram using the zones argument. By default the zones are illustrated by a legend on the right of the figure and labelled using argument zoneNames. In the code below, we add in the six significant zones in this sequence using five boundaries, Zones, and label the zones "A" to "E"
One of the draw backs of using Lattice to do the heavy-lifting of drawing the panels, is that customisation of the plot after it has been drawn is more tricky than if a solution using base graphics had been used. Stratiplot() can handle mixtures of relative and absolute data types but this code is very experimental at the moment. I'll illustrate how to use this feature in a future blog post. This functionality will no doubt be updated in future versions of analogue. I also want to add the option to use a dendrogram representation of the zones (if applicable) instead of the box-like legend now used.